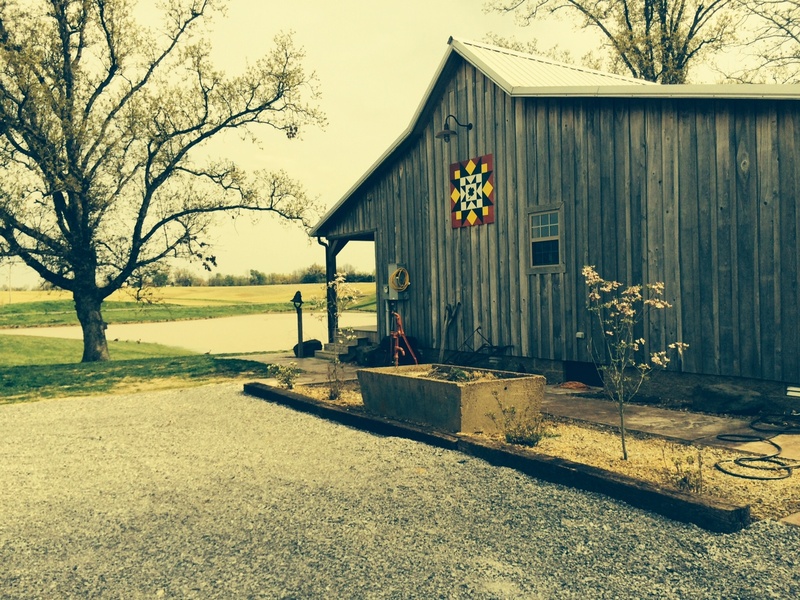 Steve, Laura and Brooke Jackson searched the internet to find their favorite barn quilt pattern. 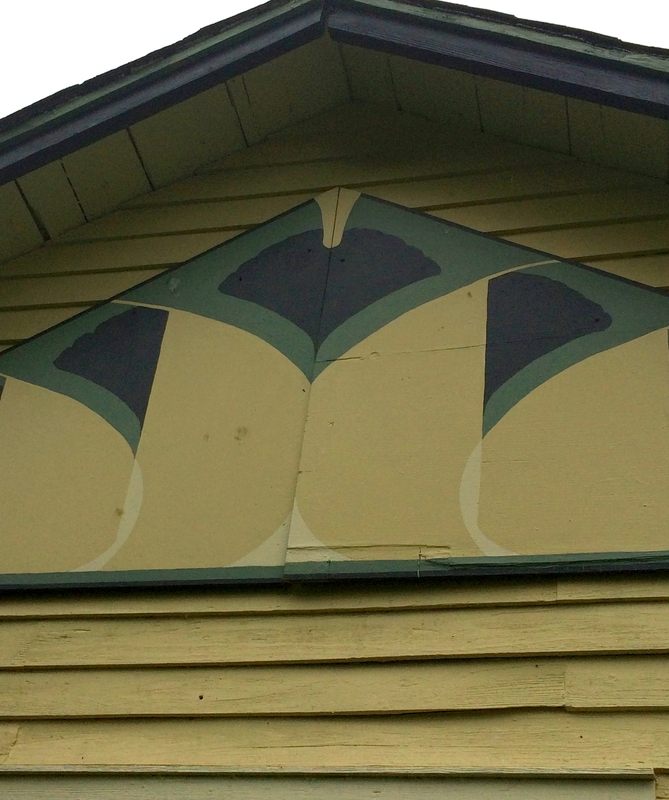 They chose their favorite colors and asked Dale Batts and Nancy Conn to paint it. 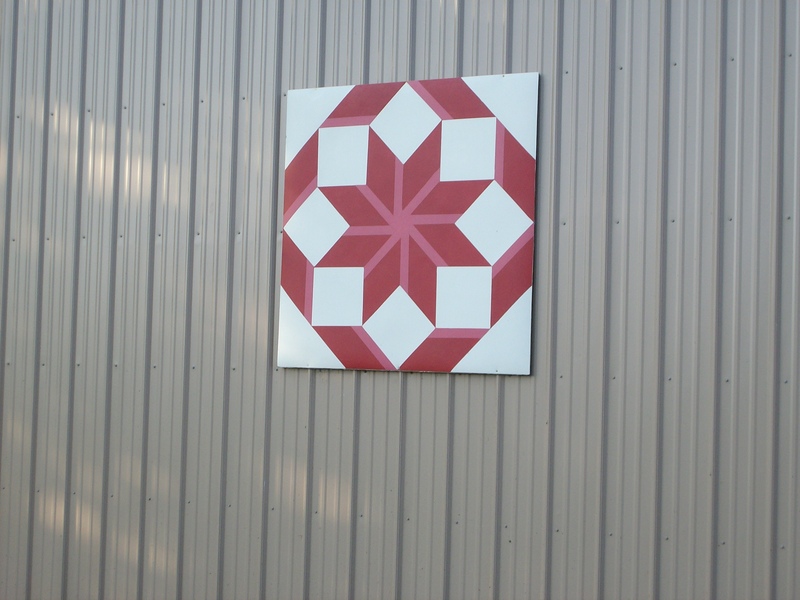 Outdoor acrylic paint was used on the 48 inch square fiberglass panel. 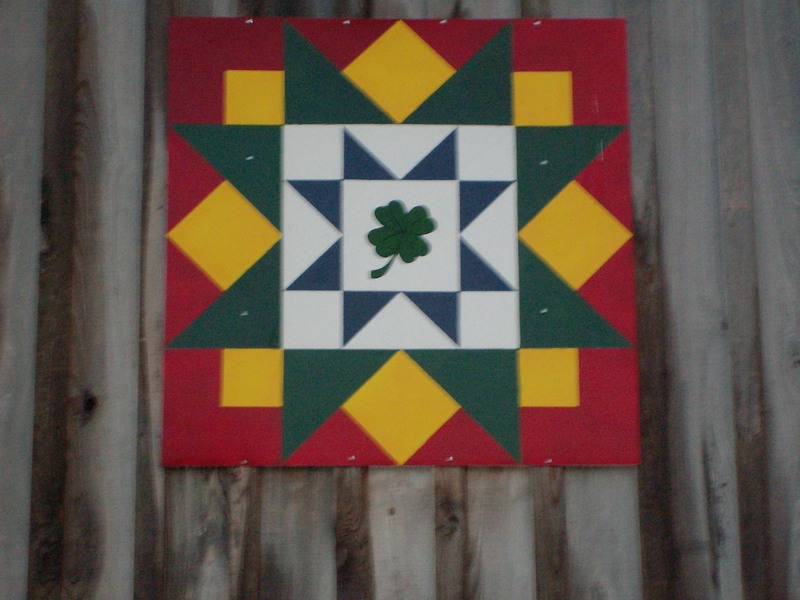 This barn quilt is on an outbuilding at the Jackson residence, 4635 State Route 944, Clinton, Ky 42031 near Jackson Chapel Community Church. John Samuels of Clinton, Horticultural Chief of the 1892 World’s Fair, brought ginkgo seedlings home to his West Clay Street residence when the great expo ended. 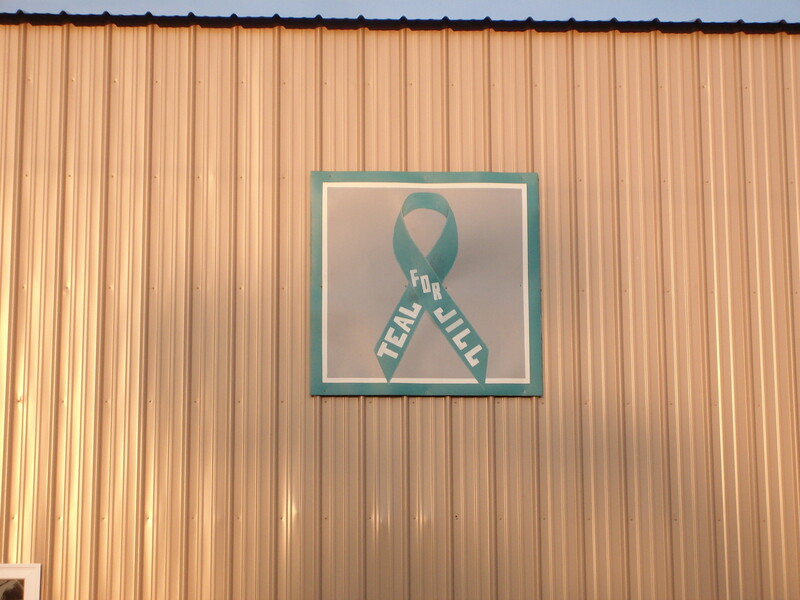 The seedlings grew to maturety and a few still exist, making the ginkgo a species that is literally rooted in Hickman County History. 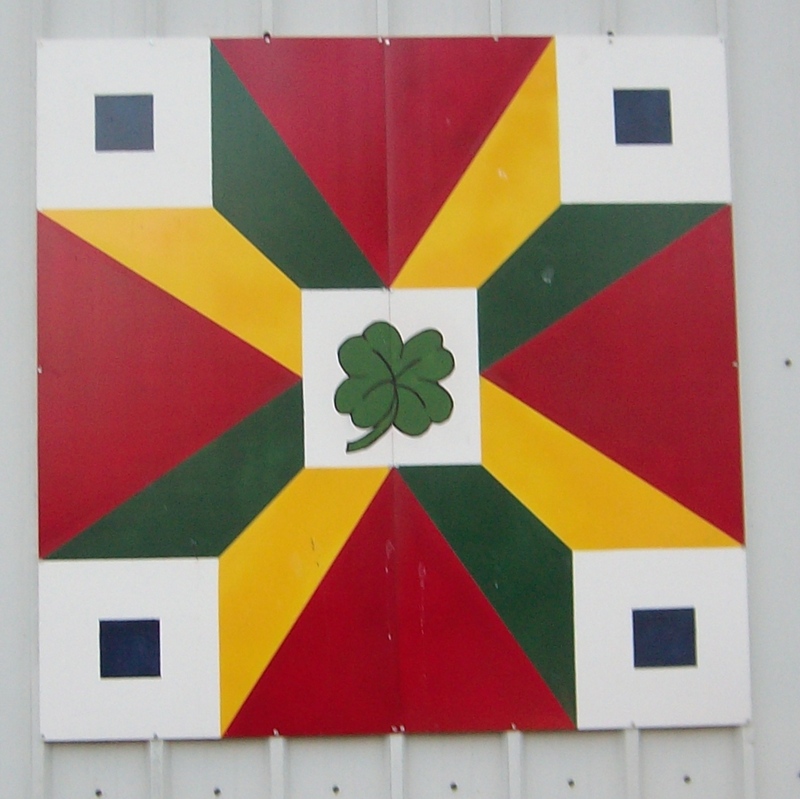 With that in mind, I created this stylized ginkgo design as a quilt triangle on the garage at The Emma House, 308 South Washington Street, Clinton, Ky 42031. The design on the garage is facing Crume Street and can be viewed from that location.. 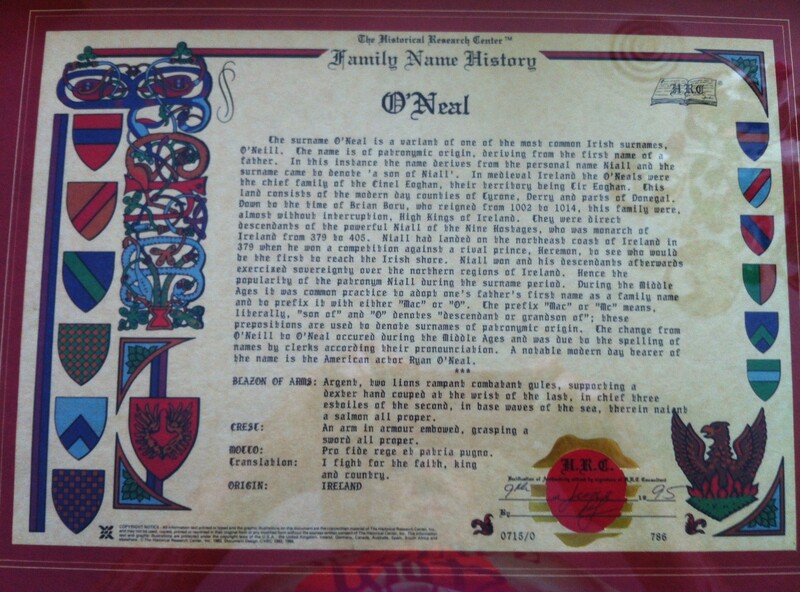 This design was selected by Andy Whitlock as a birthday gift for his wife, Karen. 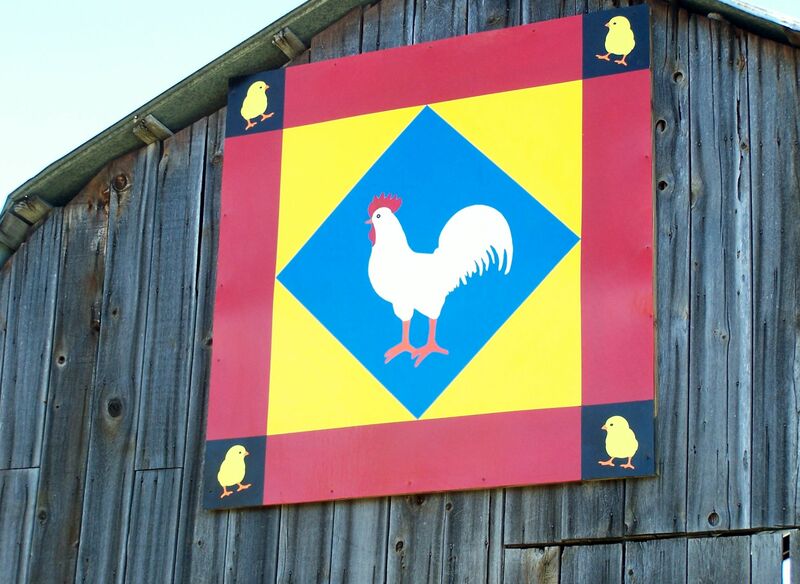 These bright colors compliment the white outbuilding on their farm at 1425 Whitlock Road, Clinton, KY 42031. 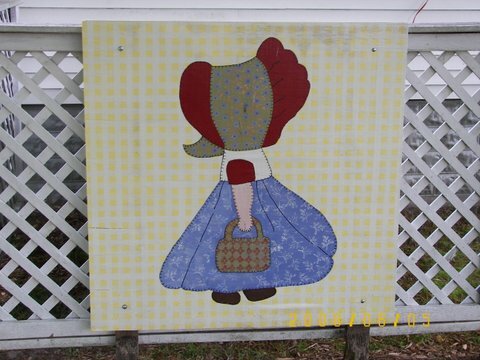 It is painted on fiberglass with outdoor acrylic paint by Dale Batts and Nancy Conn.
Jimmy and Tammy Westbrooks used a 5 x 5 piece of fiberglass board for the quilt block. Krylon fusion spray paint for plastic was used for the large areas and paint pens for the details on the large chicken. 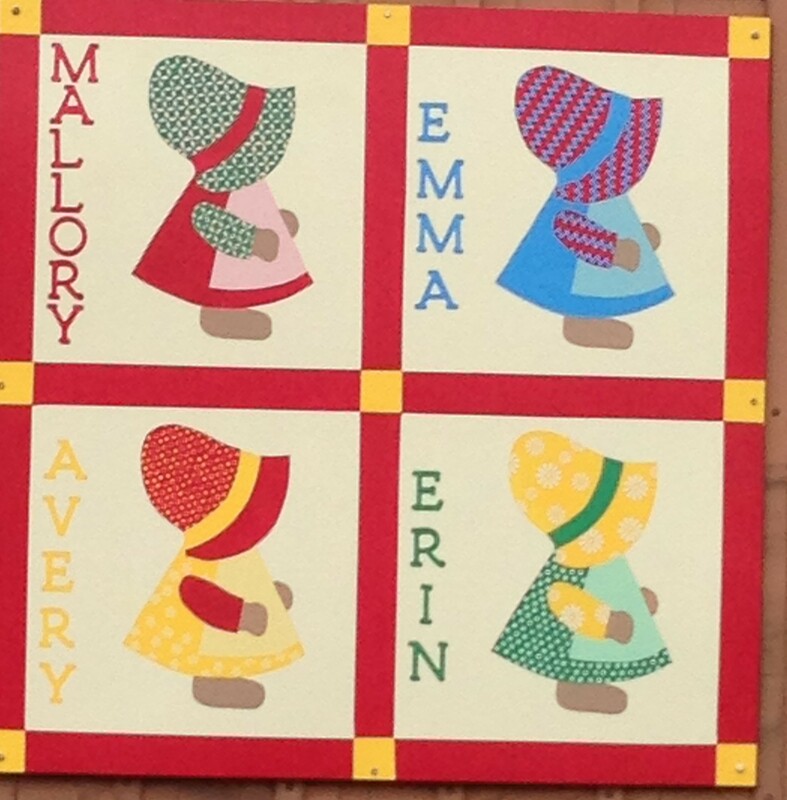 The small chicks were cut from adhesive-backed vinyl using the Cricut cutting machine and then adhered to each corner. 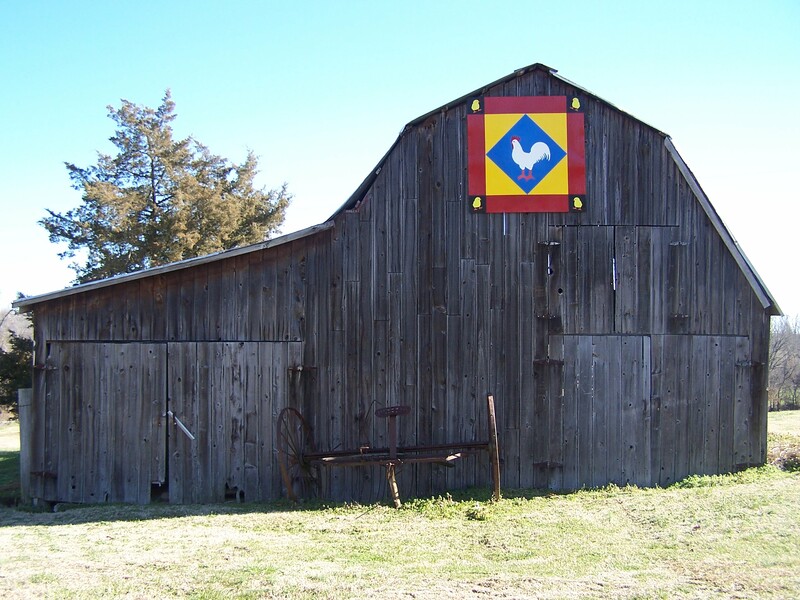 It was then clear coated before hanging it on the barn. 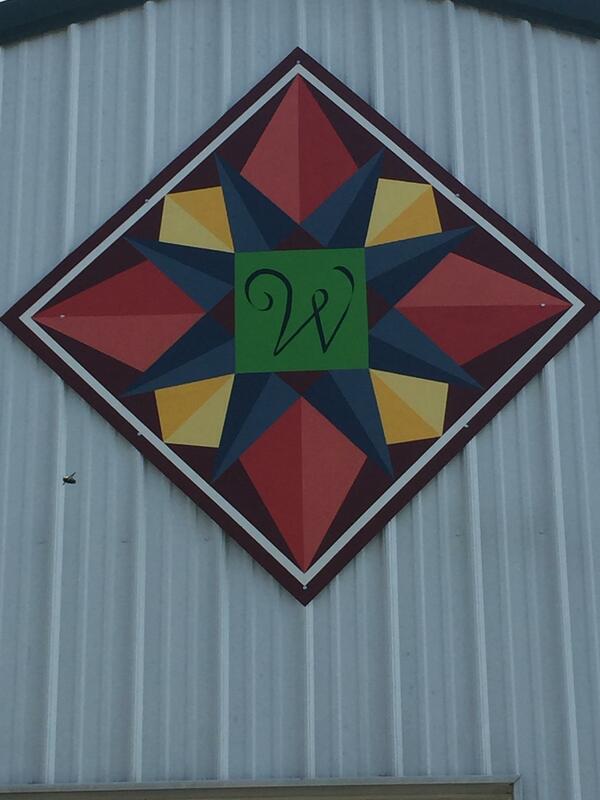 This quilt block can be seen at 1160 Wilkins Road, Clinton, KY. The design of a playful girl with a big bonnet can be traced back to illustrators who worked in the late 1800’s and early 20th century. 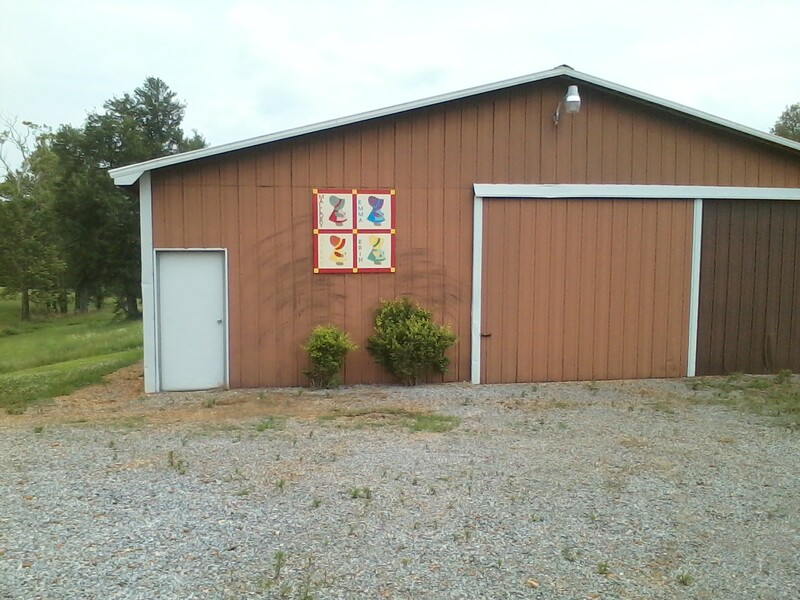 This block is also located in the yard of the Hickman County Museum and was painted by Sheri Roberts, Danny Whitlock and Lynne Deweese.